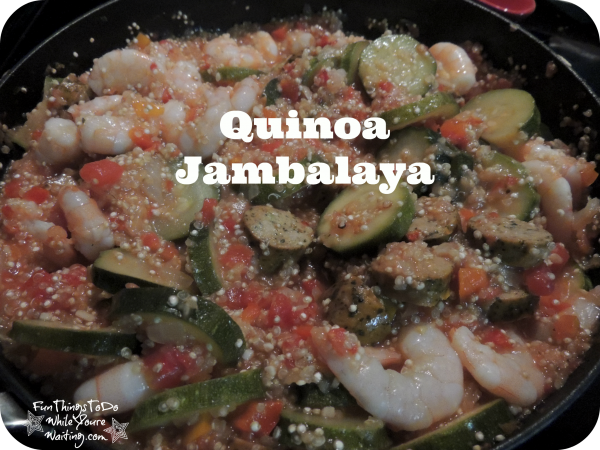 Quinoa Jambalaya- Clean and Easy. I have a hard time keeping with the cooking dinner program during the summer. It happens every year. Bub and I start giving each other pep talks in March. “This summer we are going to cook and only eat out for special, special occasions….” And then, we just throw that out the window! In summers past we have been known to eat out 4 (or more) meals in a weekend… which, when you are trying to save money and budget- is just no bueno. This summer, we are getting back to basics- again. We are determined cook our meals at home most of the time. This is a win-win situation because we can take the left overs to work and and I have them to eat for lunch on the days when Bub works and I don’t. With this determination, I have set about finding recipes that are not only healthy but easy to make as well. We run into problems during the summer because we are constantly on the go- work is very busy and we play very hard often times not getting home until dark. So preparing a complicated meal is just out of the question. 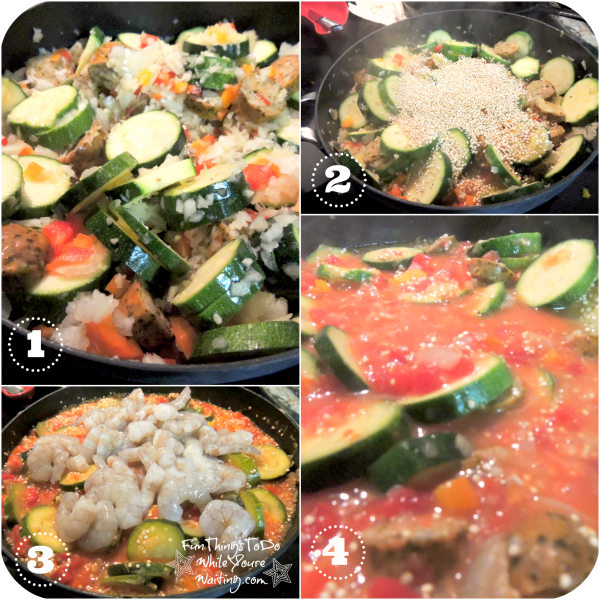 Without further ado, I would like to introduce the first recipe of the summer: Quinoa Jambalaya. It was very easy to prepare and with just minimal tweaks it was very tasty! 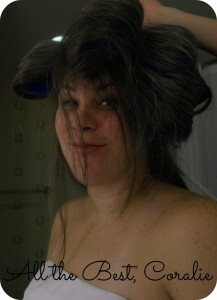 I (kinda) followed the recipe outlined here. You will need to chop an onion, a red bell pepper, 2 zucchini and a garlic glove and your chicken sausage- I used two links instead of one. Heat a tablespoon of canola oil on medium high heat in a skillet. When the skillet and oil are nice and hot add all of the above mentioned and saute for about 5 minutes. Then add a cup of quinoa. The recipe called for 1/4 cup- but, I started off with 1/2 cup and then added another 1/2 cup and Bub and I both agreed that the finished dish could have used even more quinoa. So, back to the story- even after quadrupling the amount of quinoa called for in the recipe, Bub and I both think it could have handled at least another 1/2 cup. Once you have added the quinoa, stir it around and let it get good and coated with all the sauteed veggies and sausage. Then add your can of tomatoes and initially since I was doubling the amount of quinoa, I doubled the amount of broth- I added 3/4 cups. And then you turn the temp down, cover it and let it simmer for 10 minutes. It was at this juncture that I added the second 1/2 cup of quinoa. So, I let it continue to simmer for another five minutes before adding the shrimp. The recipe calls for 1/4 pound of shrimp- well, you remember (meeember) that I am trying to make up for loss time? So, I added a pound of shrimp! I stirred all this together, covered it again and let it simmer for 5 minutes. The shrimp were pink which meant it was ready! I served this up and waited for Bub to taste it- he was busy feeding Baby Bub the other dish I cooked: warm formula! Baby Bub is at a point where he is trying everything we eat- except there are still a few things I am hesitant to feed him and shrimp is one of them. I am sure he would have like this Quinoa Jambalaya because he likes all the components except for shrimp which he is yet to try. So, we sat down to eat… dum, dum, dum… and it was good. It really was. Bub suggested that next time, (did you hear that? 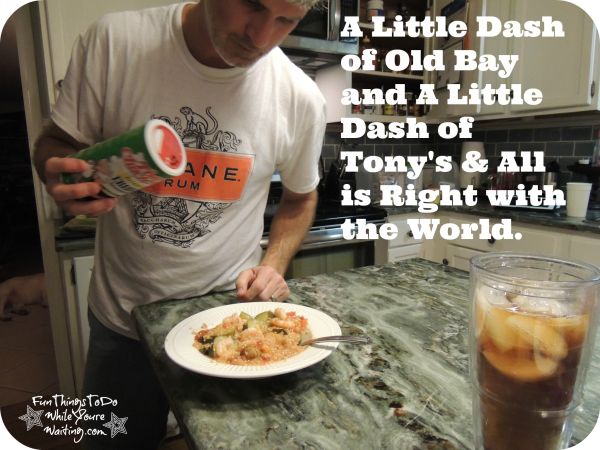 next time) that we chop up the zucchini, sausage and shrimp into smaller pieces, add more quinoa and also, add Old Bay Seasoning and Tony Chachere’s while it is cooking. We did add those seasonings to our dishes and it really pulled it all together. Warm oil on medium high heat in a skillet and add chopped veggies and sausage and saute for 5 minutes. Add quinoa and let it coat and get coated with the sauteed goodness for about 2 minutes. Add shrimp, cover and let simmer for 5 minutes. I have to say, I’m glad we tried this one and I am especially pleased that Bub is already talking about next time. It meets all of our summer recipe requirements: healthy (double check), easy (check), tasty (double check). Try it out and let me know how it turns out for you. Quinoa Salad- a 1-2 Punch! Chicken, Quinoa and Broccoli- A New Take on My Old Favorite Quinoa Breakfast Bowl: A Gut Buster… in the BEST Way! 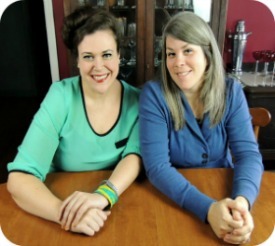 Coralie!, Healthy, Main Courses, The Pinterest Experiment, What's Cookin'? 24DC, Clean, Coralie, Healthy, Jambalaya, Main Course, Quinoa, seafood, The Pinterest Experiment, What's Cookin'? Previous Article← And… We’re Out!